Avatar giving you a headache? "My eyes! The goggles do nothing"
The Eyecare Trust has revealed that 3D films could be causing headaches for 12 per cent of the British population due to poor binocular vision. While many have raved about 3D blockbuster hits Avatar and Alice in Wonderland, The Eyecare trust has said that more than one in 10 of us "has a visual impairment that means our brains are unable to correctly process the individual images that are transmitted to it via our left and right eyes. "This leads to an inconsistency in viewing the three spatial dimensions (height, width and depth) required to enjoy 3D films in all their glory," its website said. The vision impairment can lead to reduced reading ability and increased screen fatigue when watching TV for long periods of time. Poor binocular vision can be easily detected during an eye examination, and a new pair of glasses or vision therapy can prevent the 3D-induced headaches. 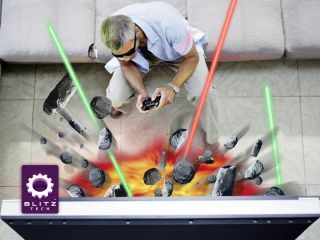 These findings could be causing their own headache for game publisher Ubisoft, who expect a 3D TV in every living room in three years and half of all games produced to be 3D-ready.